First of all, Merry Christmas! Yes, here in the Philippines we get it 16 hours earlier than those of you on the US West Coast. Yay for us. So, with everyone talking about the “True Meaning of Christmas” this time of year, including a rather meta discussion of it by xkcd, I thought I’d throw in my two cents. First, yes, I subscribe to the Charlie Brown theory of the true meaning of Christmas. Yeah, it’s about Jesus. No surprises there. 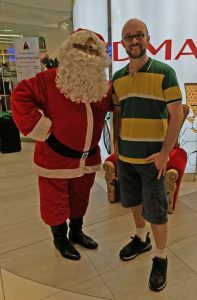 However, this year, I feel freer to do stupid celebratory things, like have my picture taken with Filipino Santa in the mall. Even though Santa has no real connection to the coming of Jesus, I’ve been realizing that not all our celebrations need to have symbolic relevance to the thing we are celebrating. For example, at a wedding, often we dance and we eat good food. Now, is dancing truly symbolic of the marriage? What about the banquet? Does that MEAN something relevant to the marriage? Maybe a little, but that’s not why we dance and feast. We dance and feast because they are simply ways of celebrating. They are sort of generic celebratory actions. And there’s nothing wrong with that. So, take all these secular-ish parts of the Christmas celebration like Rudolph, giving gifts, putting up a tree, and Santa. In one sense, these have little (or nothing) to do with celebrating the birth of Jesus. At the same time, the very fact that we are giving gifts and putting up decorations and running around in red fluffy suits shows that we are celebrating something. Let’s have that object of our celebration be Jesus, even if our customs lack symbolic value. Put another way, giving gifts doesn’t have to symbolize that Jesus was born. We simply celebrate his birth by giving gifts. Now, an even better way to do this is to imbue symbolic value into our customs. So, for those who don’t know this, most of our Christmas customs are rooted in ancient pagan holidays. Christmas is December 25th because the Catholic church wanted to replace the pagan holiday “Saturnalia” with a “Christian” holiday. Many of the customs such as gift giving come from Saturnalia. Others come from other pagan traditions celebrated at the winter solstice. Santa riding his sleigh, for example, looks suspiciously like Thor riding a similar sleigh. Thor the Germanic god, that is, not Chris Hemsworth. However, that doesn’t stop us from taking these customs and attaching new symbolism to them. So what if the Christmas tree is related to old pagan celebrations? We can still put up a tree and use it to celebrate the fact that Jesus was nailed to a tree for our sins. So what if giving gifts was a Saturnalia thing? We can use it to celebrate that Jesus was God’s gift to us. And Jesus was the light of the world. So put up some obnoxious flashing LEDs. The church I attended as a kid had an annual tradition of decorating a Christmas tree during a service and explaining the symbolism of each part of the decorations. What a great idea. You see, the story of creation is the story of God redeeming all things through Jesus. He takes sinful and broken people and transforms them into sons and daughters. But they remain the same people, simply redeemed. He is truly reconciling ALL things to himself. Sometimes it bothers me that so much of Christmas is about the birth story of Jesus: shepherds, wise men, no room in the inn, manger. Because the birth story of Jesus doesn’t seem very relevant to my life. The birth simply means that he came. The incarnation is WHY he came. The birth is a bit isolated. It’s just the story of the circumstances how he came into the world. The incarnation is full of meaning. God became a man and made his dwelling with us, and he bore our infirmities and pains. He became flesh and blood, like us, so that he could die and free us from the fear of death. Fear of death? Very real problem. Addressed by the incarnation. See, the incarnation includes not just the birth but the entire life of Jesus. It’s his miracles, his authority, his suffering, his death, and his resurrection. That is cause for celebration. Don’t forget the people who are hurting and mourning this Christmas! Comfort them and be there for them to listen to them. Merry Christmas from 88 degree, 62% humidity Manila. Enjoy this sample of my new novella, That One Time the Jeepneys Came Alive and Destroyed the Philippines. Write me a comment of what you think. Noli Reyes pulled his tricycle to the curb, the gentle thud-a-thud of the engine vibrating between his thighs. Makati? Why in the world would a tall, well-dressed foreigner like this be heading to the Makati Wasteland? Noli kicked his 60 cc engine into gear and roared down the road. “By the way, why’d you call me Joe?” the man asked. Noli frowned. “If you say so, sir.” He cut his engine, braked, and swerved to ride diagonally over a speed bump. The rusty sidecar rattled and shook. Noli had known a few NGO workers to pass through the Philippines. You really had to look after them. Most didn’t speak Tagalog and didn’t know how to get around Manila. They didn’t understand that the cost of a chicken skewer wasn’t really thirty pesos. In Manila, this guy was more helpless than a child. Noli drove up an on ramp for the Old EDSA Highway, his engine struggling with the incline. They passed a decaying billboard that had a shirtless man holding a can of tuna. Due to a hole in the billboard, now he was also headless. “Yes, yes.” Was he actually wiping his eye with a handkerchief? About flushing toilets? This NGO Joe was going to have a very rough time in Anno Jeepney Philippines. The ground leveled out, and Noli rolled to a stop behind a bus. The road was four lanes wide—which in Manila meant a mass of cars, vans, and busses between five and seven vehicles across. Traffic was at a complete stop. A dark cloud hung in the still air: the familiar tang of exhaust. This was really bad for 10 a.m. Across the divide, just a single car drove north. In the median between the two sides of the highway, a series of crumbled cement pillars once had supported the raised MRT railway but were now a monument to its demise. Noli idled. He hated idling. Noli pulled between a van and a bus—nearly removing his mirror in the process. With another zig and a couple zags, he reached a break in the median made for U-turns and used it to pull into the northbound lanes. And then he gunned his throttle. NGO Joe resumed his terrified grip on the shaking sidecar frame. They had to be hitting nearly fifty kilometers per hour—something usually impossible on Old EDSA. Here and there, an apartment or grocery store still stood, but no skyscrapers, no malls. Big buildings like that hadn’t lasted long against the jeeplords. Most of what remained were the mismatched houses of squatters built amid growing piles of trash. He dodged a pothole, footprint of a particularly large jeeplord. Other motorcycles were also taking advantage of the empty lanes to go south. Ahead, a few dozen motorcycles and tricycles were stopped in a large clump—all those who had, like Noli, taken advantage of the empty northbound lanes. He rolled up behind them, unsure what the problem was. Maybe an accident? Noli shook his head and weaved around the clump. This guy was in too much of a rush. Ahead, he could see northbound cars in an uneven line, as though stopped at a traffic light. Except there was no signal. It was so weird. As he drove toward them and looked for another U-turn lane to get back to the southbound side, he saw the reason for the backup. A jeeplord lounged across the median, blocking two lanes on both sides. A lesser jeeplord, thankfully: only five jeeps. Two formed the legs, one a torso, and two the arms. The hood of the torso jeepney stuck up just above the point where the arms attached, like a head. It was like a person without elbow or knee joints. The plate above the windshield on the head piece still bore the original name written by some now-deceased driver: Alaska. Noli slammed on his brakes, but he was already isolated in the no-man’s-land around the jeeplord. The torso section rotated toward Noli. 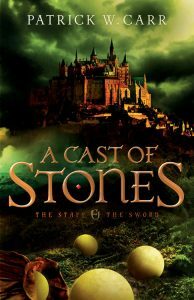 If the window-panes had been eyes, it would have been looking straight at him. “Sorry sir, I’ll drive fast now,” Noli said. Alaska stood in an upright position. At the sight of that form, Noli trembled in anger—an anger shared by all Filipinos for the destruction of their homeland. And anger for all that Noli personally had lost. But right now, there was no time for anger. He roared down the road as fast as his bike would carry him, his engine a heavy metal concert accompanied by the thundering drumbeat of his rattling sidecar. Hundreds waiting in northbound traffic stared at him. Maybe another car or motorcycle could have snuck by, but jeeplords always noticed Noli. Always. “Sorry, sir,” Noli said, hugging his bike close in the hopes he might eke out a little more speed by cutting his wind resistance. Fat chance while tugging a sidecar. Noli looked around for an alleyway: something, anything to avoid the charging jeeplord. But he’d just passed onto some kind of bridge. It was at least a quarter kilometer to the other side. And—strange how the mind worked in these crisis moments—he realized where he was. He’d driven over this bridge a thousand times back before the jeepocalypse. For a moment, he considered pressing the sidecar eject button, an illegal modification that was ubiquitous in Anno Jeepney Manila. And then he looked at that helpless NGO worker: pale-skinned, so tall he had to curl up to fit in the sidecar, wearing a clean polo shirt that was probably ironed. If he ejected NGO Joe, the jeeplord was just as likely to go after the sidecar as to chase its real target—Noli. No, he just couldn’t do that. And then he saw it: a break in the guard railing on the opposite side. The twisted railing still hung over the empty space beside the bridge. This wasn’t going to be fun. He swerved hard left, just in front of a bus—blaring horns—behind a truck—more blaring horns—and straight through the break in the railing. With a thump, they were airborne. For a moment, his body drifted weightless above the motorcycle. NGO Joe screamed. And in the midst of the terror, a funny thought came to him: at least I cleared up the traffic. Some kind of bright blue fabric wrapped around them, blinding Noli for a moment. Great, they’d landed in a market. The jeeplord appeared above the bridge, windmilling its arms as it leaped through the air. Noli swerved around another tricycle, smacking a balut table with his sidecar and sending eggs spraying in all directions. Then he heard it—a tap, tap, tap at his side. He peeked. The welding on his sidecar had come loose. One of the two steel bars holding it in place had snapped off. He didn’t have long. However, this market was along his old route, and even with all the changes, he knew this area better than the palms of his own hands. There was a church nearby. He rocketed toward it. “Hey, hey, let me off!” NGO Joe yelled. Behind him, a huge crash signaled the jeeplord’s landing in the market. Noli passed a taxi, and the church came into view, a huge stone thing built by the Spanish. Statues of saints lined the outside of the building. He aimed his tricycle for one of the large doors on the side. All around him, people ran for the sanctuary. The second bar snapped off. Noli swerved to avoid falling at the sudden shift in weight. His sidecar screeched to a stop. It would be so easy just to leave. “No, too many have died because of me,” Noli whispered. He leaned in hard and pulled a U-turn around a small truck, driving against traffic back to his sidecar. The jeeplord loomed large, stomping through the market, stall tarps wrapped around its feet and billowing in the wind like the hem of a wedding dress. The jeeplord towered over them, just a few steps away. NGO Joe jumped on the back of the bike and embraced Noli like a long-lost lover. There was no time for a U-turn back to the church. Noli sped toward the jeeplord. 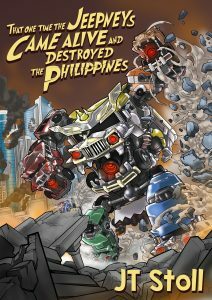 This has been That Time the Jeepneys Came Alive and Destroyed the Philippines. Also, this is what our living room looks like.